Character creation in role-playing games like Inquisition seems to get more detailed all the time—just look at all those beard options—but for me that means just one thing: being able to make my RPG protagonists look more and more like me with every new game. They're idealized, with better posture, more muscles and fuller beards, but they're definitely me—or how I'd like to see myself, at least. Throughout these games my characters do what I would do and act like I'd act in the perfect world. We help the weak, thwart the cruel and show mercy to those who deserve it. I always go full paragon and, just like in real life, I feel guilty when I stray from that path. My in-game alter-egos always romance the characters who I actually feel attracted to. In Dragon Age: Origins that meant I flirted with Leliana and ultimately wound up with Morrigan, her inner darkness impossible for me to resist. Throughout the Mass Effect series my Commander Shepard maintained an on-again/off-again, sometimes long distance love affair with the blue alien Liara. I loved her attitude and her squishy tentacle hair, and I felt a connection with her since she'd been around from the beginning. I looked forward for a long time to finding out who my true romance would be in Dragon Age: Inquisition. But as I kept playing I found myself waiting longer and longer for the Right Person to arrive. I eventually learned that Cassandra and Josephine are the only romance-able straight females in the game. They're both great in their own ways, but neither jumped out at me. I felt no love-at-first-sight. I was frustrated. I'm thrilled that BioWare created a more diverse and complex cast of characters. They aren't stereotypes, and that makes it more difficult to immediately glob onto one or another and say "this is the one for me." It forces players to go about their Inquisition romances more naturally; flirt a little here or there, but only get really serious once you've actually formed a connection with someone, as opposed to jumping straight to the redhead or the one with the most cleavage. Or you can opt out of a romance entirely, if you don't like any of the people in your protagonist's life. That's a valid option, and there is plenty more to do in this game besides get it on. I get that. But it turns out there is a Right Person for me in Dragon Age: Inquisition. I knew it the second I saw him, even though it took me by surprise: that person is Dorian, and my Herald of Andraste is gay. It all suddenly made sense. Just look at them—they're perfect for one another! 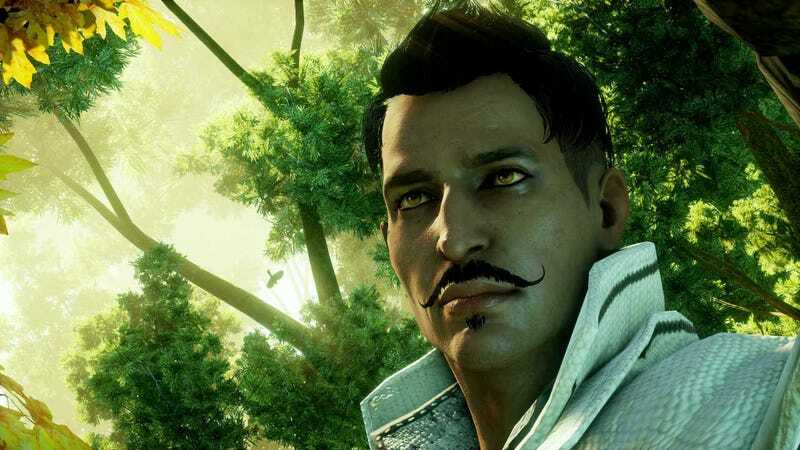 I usually try to avoid spoilers as much as possible for games I'm really looking forward to, so I had no idea Dorian existed until I met him in the game. It's an awesome coincidence that they look like they go to the same stylist, and it's easy to imagine them walking hand-in-hand down the street in my trendy hipster LA neighborhood. I didn't design my character to be gay, but then it's never really a choice, and when I realized this I actually felt as if he'd come out to me, his creator. I was excited. I even tweeted about it. People weigh so many different factors when they're designing their video game characters. One friend of mine always plays as a female character because he finds them more pleasing to look at, which is understandable. I play Destiny every week with Kotaku's Kirk Hamilton and his three Guardians, two of which are female—and for no particular reason, he told me. But at least in RPGs he does tend to play as women because "those sorts of games feel more interesting when the main character is a woman, since we rarely get sci-fi or fantasy epics with women in the lead role," which is a fair point; and he always chooses female characters in BioWare games, because the female actors are usually better. Indeed, lots of Mass Effect players—male, female and otherwise—choose to play as the female Commander Shepard because they prefer the voice actress, Jennifer Hale. I craft my characters to be like myself because it provides me with an easy way to mentally insert myself into the game world. When my character's moral compass is the same as mine I don't need to deliberate over what to do in most situations, and I can help him forge bonds with the other characters with whom I personally feel a connection. But as I get older I find myself being able to empathize better with people whose life experiences are not like my own. I'm writing more and more about female game developers and people who identify as trans, and about people who suffer from things I don't have much experience with, like developers who use games to work through their depression. And that's opening me up to new perspectives. A younger me might have been frustrated by Inquisition's lack of romance options for straight male characters, as some of the game's fans are. Straight female protagonists have four romance choices (granted depending on their race as well), twice as many as straight males, and some really appealing characters—including Leliana, Vivienne and Sera—aren't interested in romancing men (or anyone at all, in the case of Vivienne and Leliana). There are countless topics about this on Reddit and GameFAQs and BioWare's official forums, and everywhere else people gather to talk about Dragon Age, and it seems for every five people who are totally satisfied with Inquisition's relationship choices there's at least one who feels ripped off. But I recognize the unique opportunity this has given me: to for the first time see a role-playing game protagonist as something other than an avatar for myself. I still feel a connection with my Inquisitor, but he's also taken on a life of his own. As I continue trying to save the world in the latest (and possibly greatest) Dragon Age game, delivering people's letters and chasing Dorian's well-mustachioed tail, I'm not stepping into the game world itself, but into the shoes of a gay man who already lives there. And for that I am thankful.